Years ago, a child looked in wonder as a bi-wing plane roared to life, and took off into the clear blue sky; its pilot was an adventurous hero of the sky, inspiring awe from children as he whizzed by in a puff of wonder… and some exhaust fumes. The allure of aviation has transcended human generations, continuing to touch children (and adults alike) today. The children we inspire today are the future of the world, and it is up to us to ensure that that inspiration leans towards positive social progress. Thankfully, the mystique that a loud gnarly engine or a cloud of smoke used to spur in children is gone. Today the inspiration for our children comes from being green, lean, and an innovative machine. Inspiration appropriately geared to the problems facing the world today, which are unlike anything humans have faced prior, particularly climate change. Almost a year ago, I stood in a crowd of enthusiastic children, and children at heart, to welcome Solar Impulse 1 to New York City for the completion of its adventure soaring across the United States; a record shattering venture as the world’s first solely solar powered plane pushed the limits of what we knew to be possible. Continuing to inspire the world, the Swiss Solar Impulse team is now preparing for their flight to circumnavigate the globe with Solar Impulse 2. I was honoured to be able to ask our modern day heroes in flight, the pilots – Bertrand Piccard & André Borschberg – some questions regarding their upcoming invigorating, inspiring, and norm defying venture. While its achievements were many, Solar Impulse 1 was nothing more than a flying prototype, laboratory and technology demonstrator for their real aircraft. Aptly named Solar Impulse 2, the new aircraft is the one that Solar Impulse intends to fly around the world. At 2,300 kg, the new plane is almost 50% heavier than the one it replaces and has a wingspan of 72m (exceeding that of the largest Boeing 747 by 3.5m & Solar Impulse 1 by 8.5m). 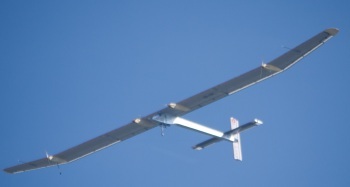 To obtain such a wingspan, the engineers at Solar Impulse worked with partners to develop carbon fiber sheets that weighed as little as 15g / m2 , approximately 1/3 the weight of a sheet of office paper. For propulsion, Solar Impulse 2 uses four 17.5hp motors that drive its 4m long propellers at a rate of 525rpm. Attached to each of these motors are new lithium polymer batteries with massive storage capabilities. With the ability to hold 260 watt hours per kilogram, Solar Impulse 2 can store an amazing 164,580 watt hours of energy, allowing it to fly through even the darkest of nights. In order to feed Solar Impulse 2’s 633kg worth of batteries, 1/4 of the plane’s total weight, the engineers needed to increase the plane’s ability to produce energy. Solar Impulse 2’s new solar arrays include 17,248 microcrystalline silicon solar cells, which represents an increase of about 50% over the original plane. These 135 micron thick cells cover 269m2 on the top of the aircraft’s wings, fuselage, and tail. The system in total is 94% efficient, setting a record with this alone. In order for Solar Impulse 2 to be able to fly through both day and night, the engineers have developed a complex system of energy conservation. During the day the aircraft will fly at 8,500m, just below the cruising altitude of many commercial airliners. While this altitude forces the pilots, without the cabin pressurisation available on most aircraft, to breathe bottled oxygen to survive, it is the optimal altitude for the plane’s solar cells to soak up the sun’s light, as well as achieve the aircraft’s top speed of 140kph. At night the plane descends to 1,500m and slows itself to conserve power and reduce pilot stress. During Solar Impulse 2’s journey around the world, this cycle of energy conservation will be instrumental to completing the critical 5 day 5 night trans-Atlantic and trans-Pacific legs where landing is not an option. 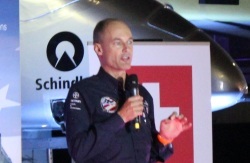 The following are questions I posed to Bertrand Piccard & André Borschberg about their upcoming venture. What is the message you hope will come across to the world, as you endeavor to complete the first world tour of a solar powered airplane? Bertrand Piccard: We want to highlight the importance of a pioneering and innovative spirit, especially in the domain of clean technologies. Nowadays, the technological solutions that allow Solar Impulse to fly both day and night without fuel are accessible to all and are replicable in everyday life. If they were used routinely in our society, we would be able to save 50% of our consumption of fossil energies and to produce half of the rest with renewable sources. André and I want to emphasize the energy, environmental and political solutions which can simultaneously create jobs, make profit, sustain growth AND protect the natural resources of our planet. We need to create enthusiasm and find the courage to leave behind the old ways of thinking which keep us prisoners of wrong directions. Aviation makes everybody dream, feeds the passions. A plane that flies without fuel and achieves something considered to be impossible can fire imagination and bring many people to invest in the practical solutions that our society needs. What is a bigger factor in your team’s motivation, combating climate change or advancing solar as well as flight technologies? Bertrand Piccard: More than building and operating a solar airplane, our team members have understood that they are producing a powerful tool which demonstrates how exploration and pioneering spirit can change the world. They are proud of it. What are some of the major lessons learned along the 12 years of development leading to the second version of Solar Impulse? André Borschberg: That you need the right mindset to start a pioneering project. First of all it needs a strong dose of optimism to overcome all the hurdles which pave the way to the final objective. Second, we learned that very often big difficulties, unexpected problems, also lead to opportunities. Opportunities to find new and better solutions and explore new fields. During the construction of the second airplane we unexpectedly broke the main spar of the wing during the final test. A major blow and potentially a big delay for the entire project. : but it also gave us the opportunity to take this time delay to take our first airplane to the USA, something we had dreamed about but had not been able to find the time to do. How do you mentally and physically prepare yourselves to attempt this historic flight? André Borschberg: The mental preparation started 7 years before the first flight, when we were developing the airplane and studying the flight routes. As the airplane started to take shape, I could already imagine myself in the cockpit. To visualize what will happen is a very strong way to prepare oneself for the real situation. The next step was to train in the flight simulator. Bertrand and I spent more than 25 hours in a row flying the simulator before flying Solar Impulse 1. Over the past two years we both experienced a 72 hour non-stop flight simulation. Being able to concentrate and to remain alert, manage our resting periods and organize our daily life in the cockpit. A good physical condition is also important, not as a sportsman, but good enough to keep the right body and mind balance. I personally do a lot of mediation in order to be able to dissociate myself from the pressure of the flight mission and use different breathing techniques during the flight to reenergize myself or in the contrary to relax deeply. I developed special exercises in order to keep blood circulation active and to relax muscles. These were more postures than exercises, derived from yoga. But above all, passion is the driving force behind this endeavor! 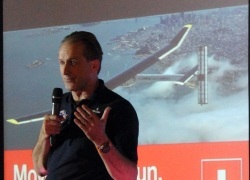 I remember last July at the event hosted by the Swiss Consulate; many children were asking when they would be able to get a ride on a plane like Solar Impulse. Understandably, passenger travel by solar plane is years down the road. What is your team’s vision for the future of flight? Bertrand Piccard: Our primary purpose is not to revolutionize aviation, but the way in which people think about energy and clean technologies. I would be crazy to say that solar aviation will transport passengers soon, but stupid to say it will never happen! The technologies for it don’t exist yet, but they also didn’t exist when the Wright Brothers made their first flight in 1903. Our project involves zero fuel. Conventional aviation cannot switch right away to zero fuel. Intermediate steps are needed, such as using lighter structures, hybrid systems, more direct routes and constant descent approaches. Commercial aviation will be the last area of transportation to stop using fuel. Solar Impulse 2 is a Swiss venture that will inspire the next generation to defy what they initially believe possible, and to work continuously towards their sky high dreams. While children have read comics and watched films on a superman who flies through the air using the power of the sun, soon it will be reality that the sun will allow people to soar around the world. I wish the best of luck to the Solar Impulse Team in preparing for, and completing their journey around the world during summer of 2015. Germany’s energy transformation 2.0: On track to become a legislative reality? Economic sanctions against Russia: What to expect next?